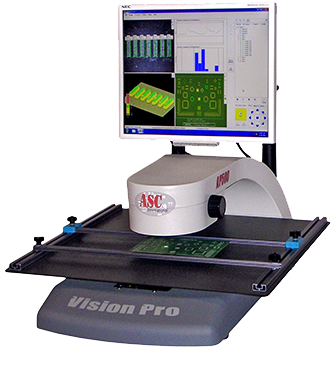 VisionPro AP500, the most popular model of ASC International’s VisionPro AP family, is a sophisticated 3-dimensional solder paste measurement system coupled with an intuitive Windows® user interface, and packaged in a rugged, bench-top system designed for the electronics production floor. With only a few minutes training, an operator can perform accurate 3D measurements of solder paste pads, BGA's and many other PCB features. VisionPro AP500’s completely automatic solder paste measurement process eliminates operator errors and offers excellent measurement repeatability.